Jehoshaphat (also spelled Jehoshaphat or Yehoshafat) (יְהוֹשָׁפָט, "Yahweh is judge," Hebrew: Yəhošafat) was the son and successor of Asa and king of Judah. Scholars have variously dated his reign to around 873–849 B.C.E. One of the "good" kings in the Bible, he was a descendant of David, and his mother's name was Azubah, daughter of Shilhi. His immediate successor was his son Jehoram of Judah, and his descendants continued to rule in Jerusalem until the Babylonian exile. Jehoshaphat's reign was a prosperous one. He instituted legal and religious reforms, fortified cities, made improvements to the Temple of Jerusalem, and strengthened the administrative apparatus of the state. In foreign affairs Jehoshaphat pursued a policy of peace and cooperation with the northern Kingdom of Israel after several generations of war. He retained former territories of Israel captured by his father Asa, helped Israel defeat its eastern enemies, and maintained Judah's dominance over the neighboring nation of Edom. However, his support of the dynasty Israel's king Ahab brought the condemnation of at least one prophet, and his own immediate descendants were judged by the Bible as among the worst of Judah's kings. Jehoshaphat himself strongly promoted with worship of Yahweh and repressed pagan religion, earning him praise from the biblical writers as one who "walked in the ways of his father David." In Christian tradition, he is listed in the genealogy of Matthew 1:8 as one of the ancestors of Jesus of Nazareth. Ascending the throne at the age of 35 years (1 Kings 22:42), Jehoshaphat spent his first regnal years fortifying his northern cities, which his father Asa had captured earlier, against a possible attack from the Israel (2 Chron. 17:1–2). In religion, he reportedly refrained from "consulting the Baals" and destroyed sacred pillars dedicated to the goddess Ashera (2 Chron 17:2–6). He also repressed the tradition of male shrine prostitutes (1 Kings 22:46). However, 1 Kings 22:43 disagrees with Chronicles as to whether he removed unauthorized altars located at various high places. Chronicles, taking the more approving view, reports that he did destroy the high places and that, in the third year of his reign, he sent out priests and Levites throughout the land to instruct the people in the Law (2 Chron. 17:7–9). He also solidified his monarchy's administrative apparatus and greatly enriched Judah's treasury. His administration even extended to the nation of Edom, where a deputy ruled on Jehoshaphat's behalf (2 Kings 22:47). Having thus strengthened his domestic situation, Jehoshaphat pursued a diplomatic policy of peace with the northern kingdom, allying with Israel against Syria, Moab, and Ammon. Despite the propriety of Jehoshaphat's reign, Judah was the weaker partner in this alliance, due to Israel's superior resources and its better access to Mediterranean trade ports. In the third year of his reign Jehoshaphat traveled to the northern capital to meet with King Ahab of Israel. In addition to military and trade agreements, Jehoshaphat agreed to a marriage between his son Jehoram of Judah to Ahab's daughter Athaliah, who would later rule as queen of Judah. A key ingredient in the alliance was Jehoshaphat's willingness to join Ahab against the Syrian king Ben-Hadad in the battle of Ramoth-Gilead. Asked to join Ahab in a battle to recapture the town of Ramoth Gilead from the Syrians, Jehoshaphat replied: "I am as you are, my people as your people, my horses as your horses" (1 Kings 22:5). The biblical writers are ambivalent as to whether or not this alliance was inspired by God. 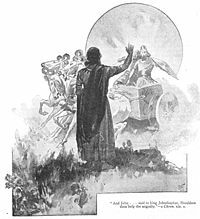 Ahab had previously received prophetic support in battles against Beh-Hadad, but was strongly denounced by Elijah for supporting Baal worship and personal corruption. A passage in 1 Kings 22:1-33 describes four hundred prophets approving the plan to march against Ben-Hadad, against one dissenting voice voice—that of Micaiah ben Imlah. Yet even Micaiah admits that God wants Ahab to attack the Syrians, for it is God's plan that Ahab be killed in the battle. Jehoshaphat fights bravely at Ahab's side in full kingly regalia, while Ahab disguises himself as a common charioteer. Ahab, nevertheless, is killed, while Jehoshaphat safely returns from this battle. Back in Jerusalem, the king is confronted by the prophet Jehu, son of Hanni (2 Chron. 19:1–3), who reproaches him for his alliance with Ahab's family: "Should you help the wicked and love those who hate the Lord? Because of this, the wrath of the Lord is upon you" (2 Chron. 19:2). God's wrath does the king no harm, however, as we are told immediately that Jehoshaphat "turned back to the Lord." He also carried out a significant judicial reform, appointing judges throughout the land and ordering them: "Consider carefully what you do, because you are not judging for man but for the Lord... There is no injustice or partiality or bribery" (2 Chron. 19:6-7). He also further strengthened the system of religious law centering on the Temple of Jerusalem by appointing Levites, priests, and clan heads to administer justice there. Jehoshaphat also entered into an alliance with Ahab's son Ahaziah of Israel, for the purpose of carrying on maritime commerce with Ophir. However, the fleet that was equipped at Ezion-Gever was wrecked. A new fleet was fitted out without the cooperation of the king of Israel, and although it was successful, the trade was not prosecuted (2 Chron. 20:35-37; 1 Kings 22:48-49). When Ahaziah died, Jehoshaphat joined Jehoram, king of Israel, in a war against the rebellious Moabites, who were under tribute to Israel. This effort received the grudging approval of the prophet Elisha, and was successful. Through a miraculous intervention, the Moabites were beaten back to the the walled town of Kir Hareseth. Mesha's desperate act of offering his own son in a human sacrifice on the walls of the town brought "great wrath" against Israel, whose forces, including those of Judah, withdrew to their own lands (2 Kings 3:4-27). Miraculously, the attackers' coalition broke down, and they began fighting violently among themselves, the Ammonites and Moabites against the "men of Mount Seir" (Edomites). A large number of Edomites were killed in the battle, leaving to the people of Judah to gather the rich spoils of the slain: "There was so much plunder that it took three days to collect it" (2 Chron. 20:25). Soon after this victory, Jehoshaphat died, after a reign of 25 years at the age of 60 (1 Kings 22:50). Like his ancestor, King David, Jehoshaphat's family faced trouble, division, and bitter intrigue. 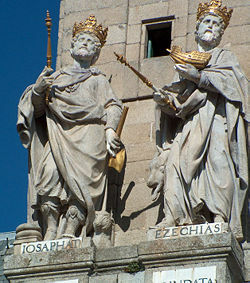 He named his first-born son Jehoram of Judah to succeed him, but also bequeathed wealth and the governorship of several fortified cities to Jehoram's brothers Azariah, Jehiel, Zechariah, Azariahu, Michael and Shephatiah (2 Chron. 21:2). To solidify his rule, Jehoram reportedly killed all of his male siblings. Under the influence of his wife Athaliah, a Baal worshiper, he pursued a policy of toleration toward pagan religions. To make matters worse, under Jehoram, Edom successfully revolted, and Judah was forced to acknowledge its independence. Later, a raid consisting of Philistines, Arabs and Ethiopians looted the king's house and carried off all of his family except for his youngest son Ahaziah of Judah (also called Jehoahaz) (2 Chron. 21:16 ff.). Like his grandfather Jehoshaphat, Ahaziah allied with Israel against Syria. 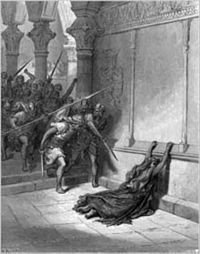 However, while visiting with his ally Joram (Jehoram) of Israel, Ahaziah was killed during a bloody purge of the house of Ahab by the divine-approved usurper Jehu. This left Jehoram's wife Athaliah in a position to seize the the throne in Jerusalem, where she conducted a bloodbath of her own. After six years, she was assassinated in a counter-coup orchestrated by the priests of the Temple of Jerusalem, who placed their young protege, Athaliah's grandson Jehoash, on the throne. The drama had now come full circle, as Jehoash, under the tutlelage of the priests, returned—albeit temporarily—to the Yahweh-only policy of his great-grandfather Jehoshaphat. As a king of the Davidic line, Jehosophat's descendants continued to reign in Jerusalem under the Babylonian exile. In Christian tradition, he is one of those listed as an ancestor of Jesus of Nazareth in the genealogy of Matthew 1:8. ↑ The chronologies of the Books of Kings and Books of Chronicles differ somewhat, as do expert estimates of the reigns of the biblical kings. See Kingdom of Judah and Kingdom of Israel. ↑ This Jehu is to be confused with King Jehu who later reigned in Israel. ↑ The names of the kings of Israel and Judah during this period are easily confused. Jehoshaphat's son was named Jehoram, and his grandson was named Ahaziah; both of them reigned as the king of Judah. Meanwhile Jehoshaphat's contemporary, Ahab of Israel, had two sons who reigned as king, and their names, too, were Jehoram (Joram) and Ahaziah. Albright: 873 B.C.E. – 849 B.C.E. Thiele: c.870 B.C.E. – 848 B.C.E. This page was last modified on 7 January 2019, at 22:29.